The original Calf Head Roping Dummy! 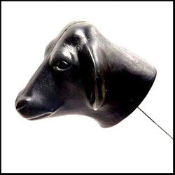 This life size roping calf head weighs about two pounds and is made of highly durable polypro plastic. Includes two 14" steel rods for use on a bale of hay. The threaded steel mounting inserts come with a Lifetime Warranty not to pull out! This head can also be easily attached to the Jr Steer Head Roping stand available on our site.